Most parents and kids wouldn’t consider strep throat the subject of high art. But the judges of the Federation of American Societies for Experimental Biology’s 2013 BioArt competition think it is. 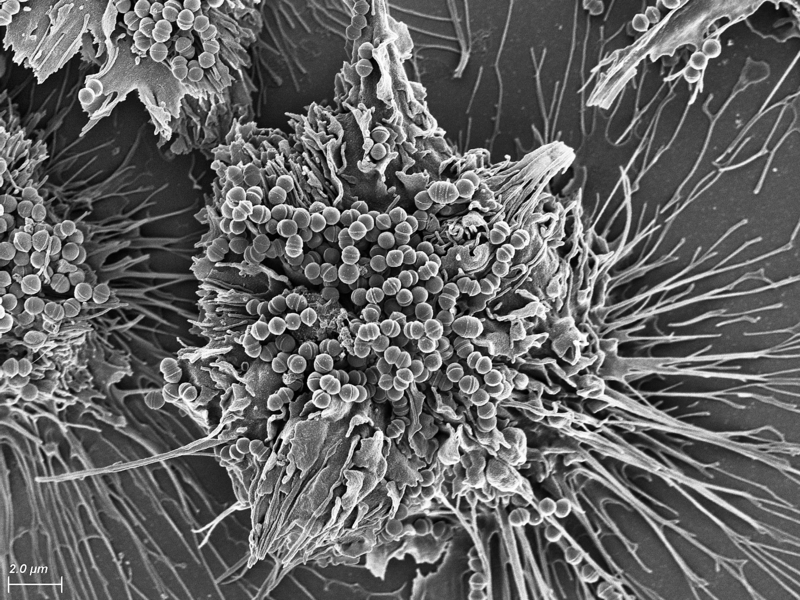 In this silver-toned scanning electron micrograph, you can see hundreds of tiny spheres—bacteria called Group A streptococci—attached to a human pharyngeal (throat) cells grown in a lab dish. These bacteria are responsible for a very nasty type of pharyngeal inflammation commonly known as strep throat. Strep infections are usually treated with antibiotics; left untreated, they can lead to rheumatic fever, rheumatic heart disease, and even kidney disease. In the lab where this winning photo was taken, NIH-funded researchers are exploring how proteins on the surface of strep bacteria enable them to attach to human cells. This work will inform efforts to develop new strategies for treating and possibly even preventing strep infections. Now, what parent or kid wouldn’t love that! Amazing, I love it when people take parts of anatomy and show how insanely beautiful they actually are!